Many couples are wanting to get their kids or families kids involved their special day, especially those having second weddings and are bringing together kids from another family. 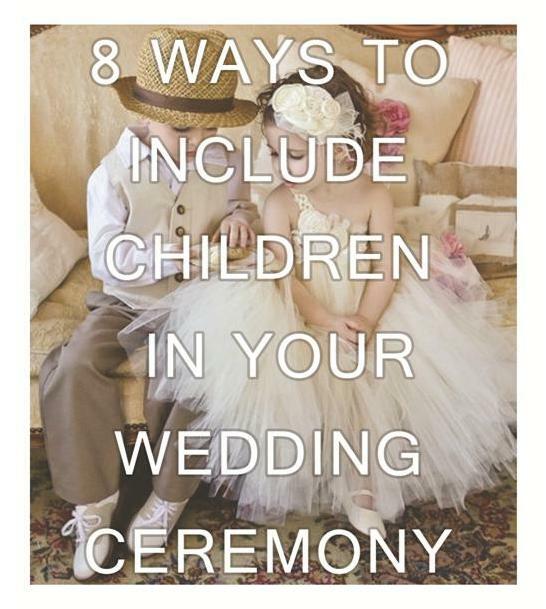 Here are 8 ways to include your special little people in your wedding ceremony. 1. Ring Bearer- A lovely traditional job for a young boy and one that always makes the bearer feel very special. 2. Flower Girl- What little girl doesn't love the idea on walking down the aisle tossing flowers? 3. Junior Bridesmaid/ Groomsmen- Suitable for an older child (7+). There's no rules here, your bridesmaids & groomsmen can be made up of whomever you like. 4. Usher- This is a great job for children aged 5+ or even younger with supervision. Handing out programmes and if able directing guests to their seats. 5. Reading or Song- If you have a well versed or talented child and they are confident to get up in front of your guests to read a piece or play a song then how lovely would that be!? 6. Lemonade/ drink stand attendant- Many weddings we are seeing have refreshment tables set up and what a great job for an older child to help show guests how it all works. 7. Guest book attendant- This is probably a job that an adult won't appreciate, a child however may relish in taking the guest book around to your guests and making sure everyone has had a chance to write in it. 8. Expert bouquet holder- The Maid of Honour or Chief Bridesmaid usually holds the Brides bouquet during the ceremony but there's no reason why that privilege shouldn't be given to a special little someone in your life. Just maybe that little someone is not the kind to pick apart your bouquet while your not watching!